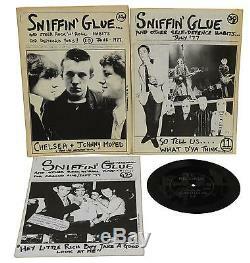 Sniffin' Glue and Other Rock'n' Roll Habits.. 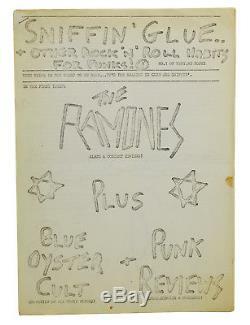 Complete twelve issue run of the rare original punk fanzine. Mimeograph stapled magazines, mostly single-sided. Complete run of issues 1 through 12, supplements not included. S "Love Lies Limp" flexi 7 with #12 on SG Records. Very Good to Near Fine. Scarce issue #1 folded, a little toned, with a few small stains on wraps. Issue #9 signed on first page top margin by guest editor Steve Mick (Stephen Micalef, author of The Punk Kings of Dyslexia). Some light staining and very light foxing, mostly to covers; stain on first page of #6; faint wrinkling and faint dampstaining to front cover of #2. Slight toning to certain covers; issues #10 and #11 being the most toned. A rare set of the renowned British punk zine embodying the cheap, fast, brash DIY spirit that would be punk's legacy. We specialize in rare and out-of-print books! 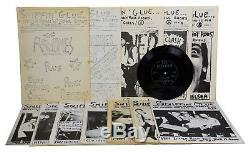 The item "SNIFFIN' GLUE 1 to 12 Complete Punk Fanzine First Edition 1976 1977 Mark Perry" is in sale since Thursday, July 19, 2018. This item is in the category "Books\Antiquarian & Collectible". The seller is "burnsiderarebooks" and is located in Portland, Oregon. This item can be shipped worldwide.